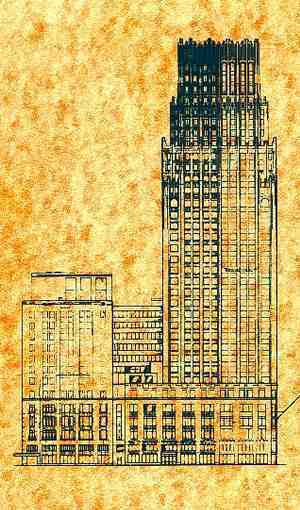 Gulf Building Houston Texas, and architect Alfred C. Finn. 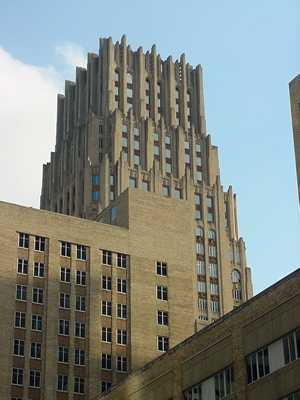 Style: Characteristic of 1920s American skyscrapers in Northern cities, the Gulf Building is described in the 1990 AIA Houston Architectural Guide as having a "crypto-Gothic" tower profile with Art Deco ornamentation. The house of Charlotte Baldwin Allen, wife of one of the founders of Houston, had originally been located on the site. By the time of Mrs. Allen's death, in 1895, the neighborhood was already in transition from residential to commercial use. 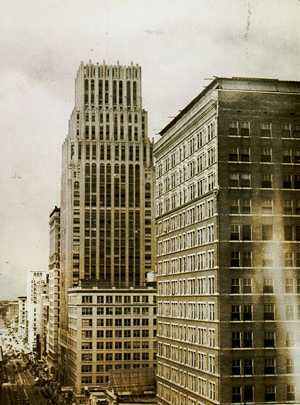 Two annexes, one of 13 stories and the other of 16, were added after World War II but are freestanding structures and not attached to the building proper. 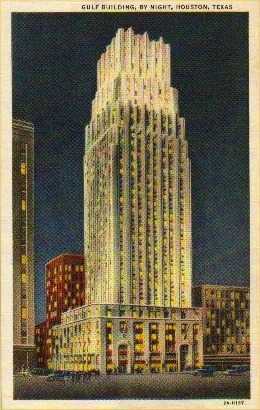 Atop the 37th level was a viewing platform which housed the Jesse H. Jones Aeronautical Beacon. This beacon was described as two searchlights, one pointed in a vertical position emitting 15,000 candlepower and another pointed in a horizontal position emitting 8,000 candlepower. It was touted as an aid to government mail planes. Also mounted on the roof of the building was an observation deck equipped with a telescope. It was said that on a clear day Galveston was easily visible. 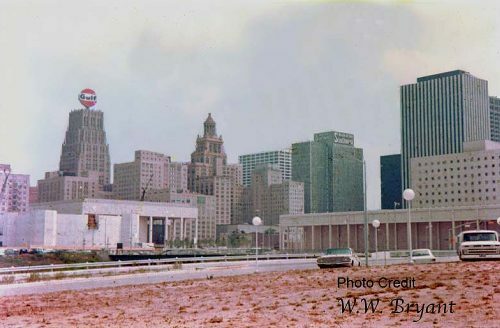 From 1965 to 1974 a 53 foot high rotating sign with the name GULF was mounted atop the building with 4,700 square feet of display area and 7,350 lineal feet of neon tubing. Pneumatic tubes, like those found in old department stores or in drive-up bank windows were installed in the building. Leather pouches from this system are said to be on display on the 17th and 19th floors. The great window above the Travis Street entrance, with its stained-glass depiction of the Battle of San Jacinto, was installed in 1960. 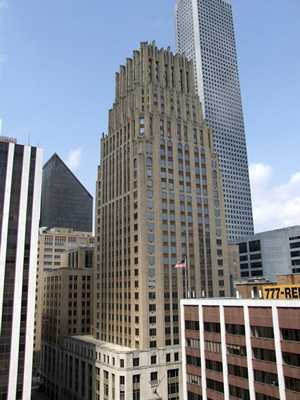 It was the tallest building west of the Mississippi River until 1931 (surpassed by a Kansas City building), and the tallest building in Houston until 1963 when it was surpassed by the Humble Building. 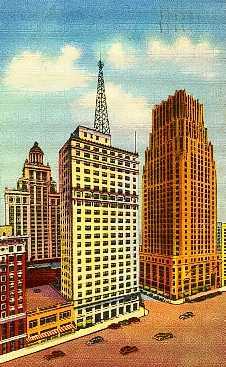 The three original tenants were to be the National Bank of Commerce, the Gulf Oil companies, and the Sakowitz Brothers store. 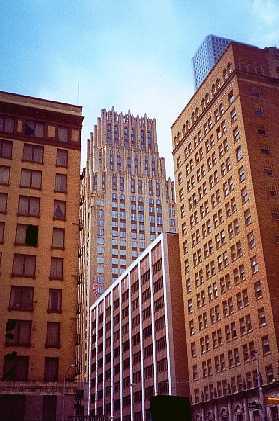 The Gulf Building was one of only two Art Deco skyscrapers erected in Houston. 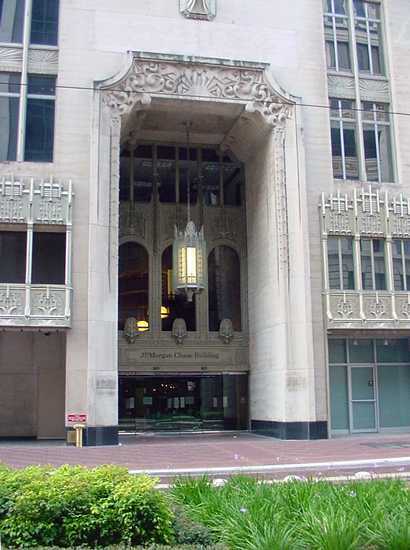 In 1987 Texas Commerce Bank (the present owner) spent 50 million dollars on rehabilitation. 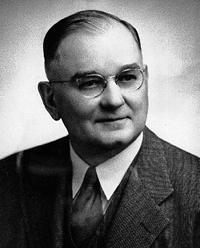 "The man who built Houston"
Alfred C. Finn, principal architect was originally from Bellville, Texas. 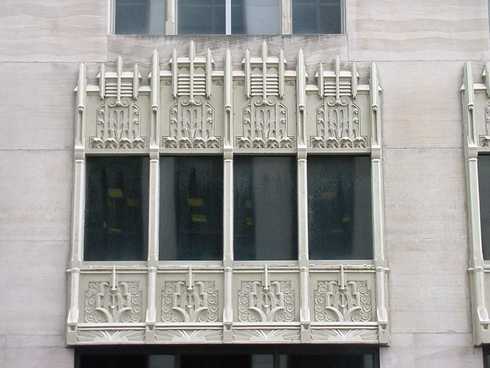 Sent to work in the Houston office of Sanguinet and Staats in 1913 he opened his own office two years later and commenced upon a long career, becoming known as "The Man who Built Houston." 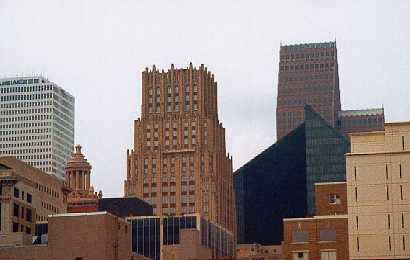 Other Finn projects included the Houston Light Guard Armory, the Lamar Hotel, the Metropolitan and State theaters in Houston (both demolished), the second Jefferson Davis Hospital (razed in 1989), the Federal Building in Galveston, the San Jacinto Monument, the Brenham Country Club, the Simon Theater in Brenham (undergoing restoration in 2006), a high-rise bank in Tyler, Texas and the former San Jacinto High School in Houston (now an Houston Community College campus). Thank you so much for Texas Esapes. My family and I have planned many day trips from there.